Great Whisky or Great Batch? I don’t care. This was the Single Malt Scotch (no age statement) of the Year as well as the World Whisky Of The Year at the highly coveted First Annual Totally Subjective Whisky Awards. Yes, that’s from my blog. Thanks to @Nozinan I was able to secure a bottle of this whisky at a civil price. And I’m very grateful. Palate (undiluted): surprisingly friendly for something bottled at over 50% ABV. Rich, oily mouthfeel. Dark fruit (dates, figs) walnuts, black pepper. Finish: long. Really long. More chocolate. Black liquorice. Fresh tobacco and cigar ash. A finish that stops you in your tracks. A little splash of water brings more big, dark fruit notes out. I’m reminded of a blackberry tart with dark chocolate, paired with a cigar. This whisky really develops beautifully on the palate. I'm a big fan of this whisky, age stated or not. Thanks for the review. It made me think that I should not keep this bottle at the back of my whisky cupboard and should take it out more often. Maybe it is 54% ABV or a rather complex palate, but I do find drinking it a bit of work and keep reaching for something else instead. @OdysseusUnbound, thanks for your review. People, like me, are going to want the bottling date for your review to be meaningful. Every single bottling of every single whisky is different, especially of the heavily peated whiskies. Yes, Uigeadail is usually quite good, but some batches are much better than are others. @Victor I will post it here in the next day or two. I promise. I'm glad you had a chance get this bottle. I like many of your choices for your awards. I haven't tried them all, but given all such awards are subjective I think they are as valid as any other. At least none are out in left field like JM's can be. I really ought to visit your site more often, It looks like I'm missing quite a bit. Now there's a NY resolution I can probably keep! @OdysseusUnbound - Nice review. My first experience with this was of a very obviously sherry influenced malt compared to the 10. My last bottle, drank about a year ago, was significantly less sherried and more 'tequila-ish' but still excellent. You seem to have got quite a sherried one here? Congratulations on getting a splendid Uigeadail, one of the best whiskies I've ever had! @Alexsweden - I'd second that. My first encounter with it in particular seemed other-worldly good. @OdysseusUnbound I am surprised by the flavor you get out of... the 10. Do you really get dark chocolate, licorice and coffee in the 10? For me the 10 is all about citrus, mineral water, dry ashes and vanilla. Sometime I find that the sherry of the Uigeadail is masking the true beauty of the Ardbeg malt, so I do prefer when the sherry is more in the background for this distillery. Nice review. @RianC I was a tad worried, as @Victor has had some unremarkable (downright bad?) bottles of Uigeadail, and @Nozinan went to great lengths to help me get my first bottle of Uigeadail. But this Oogie has delivered the goods...bigly. Batch variation is a real thing, as my current experience with a particularly uninspiring bottle of Crown Royal Northern Harvest proves, but I feel it would be more frustrating to experience an "off" bottle of something expensive and/or hard to find. @OdysseusUnbound, L 10 194 (old labeling) was the only Uigeadail which I have sampled which was very strongly 'off' from the extremely high standard set by L 10 151 Ardbeg Uigeadail. L 10 194 was an extreme contrast to what had been my favourite malt whisky, L 10 151. L 10 151 remains a top favourite malt of mine. I had commented in the review that I considered L 10 194 initially to be an 86 point whisky, but reflection led me to re-assess that 82 points would have been more like it for its initial quality. I think that I also mentioned in the comment trail that, after the bottle was open about a year, L 10 194 got much better, and became with air exposure an 89-90 point whisky. 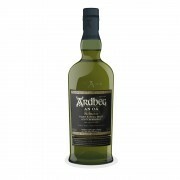 Once of the nice things about Ardbeg is that lesser batches usually improve substantially with extended, e.g. 8-12 months, air exposure. I have seen it with lesser batches of Ardbeg Ten and Corryvreckan, as well as with L 10 194 Uigeadail. Almost any Ardbeg about which I would be lukewarm at first I found would improve with just more air time. Any exceptions to this? Yes. Ardbog and Galileo are better at first, because in those cases, sulphur becomes much more apparent after long air exposure.